It’s odd how $2 bills seem to be rare, but really aren’t. At least, I don’t think they’re as rare as everyone seems to think. It’s just that people seem to hoard them and banks rarely have them. I actually managed to get about 35 of them, mostly from a Bank of America. I’m saving the four of them that are series 1976. I actually entered them all in Where’s George and plan on spending the ones from later series. I actually just ordered a stamp from Stamp Connection for $2 bills. I’m holding off on spending the rest of the bills until it arrives. I do feel a little bad about marking and spending the bills, but I can always get more and I believe that they’re still being printed. 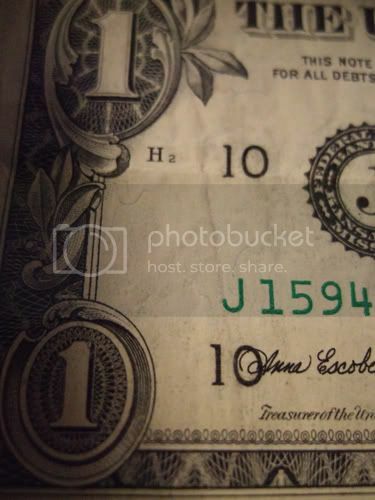 In other bill news, I found a $1 bill with the serial number printed off center. It’s not as obvious on the right side, but you really notice it on the left, where the district number overlaps with the signature of the Treasurer of the United States. The bill was entered, but not marked. From what I’m told, it’s not worth much above face value, but I think it’s interesting. If I find any more, I’ll post pictures. That’s all for now. I managed to get $130 in Toms today.